A crypto currency or a digital currency as some crypto space denizens prefer to call them, are gaining popularity. The 90 billion dollar diamond industry has been in existence for at least half a century, so does it really need blockchain and crytptocurrency technology. As any diamond veteran would tell you, the industry is showing clear signs of stagnation. Uncertain economic conditions in many nations would be one of the reasons for this but, the industry itself has to take some blame for this situation. GLITZKOIN as the world’s first diamond blockchain project to headed by a diamond veteran, has made substantial headway into educating diamond industry stalwarts. Large diamond sellers are now giving a close look to the concept of blockchain and digital currency. The concepts related to cryptocurrencies are not as clearly understood as the framework of a blockchain. Behaving much like a ledger, a diamond blockchain would allow sellers from any location to list their diamonds on the blockchain. Leveraging on decades of expertise in the diamond industry, the GLITZKOIN management has included an entire trading platform in the project. So was it necessary to implement a crypto currency for the project, does the crypto really add value to the entire plan. Before we jump to the utility of the GLITZKOIN token on the blockchain trading platform, let us briefly talk about the present procedures being followed. Diamond trade currently relies on the banking system to settle payments. Besides variations in government policies that, can translate into banking regulations, banks are known to bill significant charges to process payments. International trade in diamonds involves multiple currencies, this brings up the challenge of currency conversions. Another reason for banks to charge various types of fees. By utilizing a crypto currency to make payments on a diamond blockchain, the need for routing through the banking system can be eliminated. Blockchain technology was initially developed to transfer money across the globe, more importantly the processing cost was significantly less as compared to bank charges. The issue of currency conversions is also irrelevant when a digital currency is used. Let’s just step back and consider the GLITZKOIN plan without a crypto currency but, including a diamond trading platform. A platform where diamond sellers and buyers could transact in listed diamonds. Successful transactions would need to move out of the platform to fulfill payment processing. In the case of the diamond industry, it would imply that, participants on the platform have to continue to deal with the challenge of being totally dependent on the banking system. 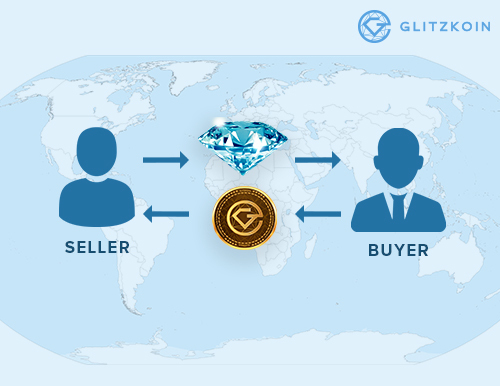 We did mention that the GLITZKOIN token will be used instead of money (conventionally currency) on the diamond trading platform. What we must mention is that, these tokens will also be listed on popular crypto exchanges. So crypto enthusiasts who would like to trade in this token can undertake their buy and sell activity on these exchanges.